Education that makes a difference, one mustang at a time. Learn horsemanship with our mustangs or your horse. Take charge, save a mustang, and train it yourself. Get fit mastering the excellent science of horsemanship. 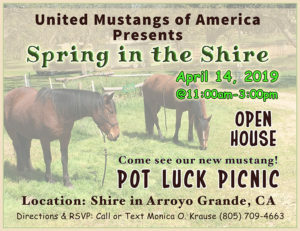 Get involved in a variety of ways to help and celebrate with the mustang community. Your first Horsemanship Lesson constitutes as your Annual Club Membership. Club membership allows you to participate in all club activities and have a running in our “End of Year Celebration” Contests. Membership packages are based on whether you choose to participate in group or private horsemanship lessons. All horsemanship lessons and trail rides are tailored to your specific goals and needs. 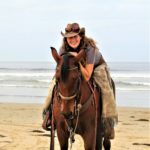 Trail Rides: Allow a 3 Hour time block for Pismo Beach. Allow a 5 Hour time block for Montana de Oro. Time block includes travel to and from education facility. Are you a 1★, 2★, 3★, 4★ or 5★ member? Payments are currently accepted as check, cash or Venmo @MonicaOKrause. Join us for our first ever Montana de Oro Summer Camp! Call coach Monica O. Krause now to schedule! 805.709.4663. Or email info@unitedmustangsofamerica.com. Horsemanship Lessons take place in Arroyo Grande, California. Directions to location will be given upon sign up.